29 days minimum stay. First floor corner unit no one above this unit. Cozy, one-bedroom/one-bath, private condominiums located in the exclusive, gated Palm Springs Villas 2 complex. Enjoy the greenbelts and beautiful mountain views from the pool. Palm Springs Villas 2 has six large pools, eight spas as well as 2 tennis courts, shuffle board, and a practice putting green. Palm Springs Villas 2 is professionally landscaped and maintained with on-site security. The Casinos, Downtown Palm Springs, and the Tram are just minutes away! Best Location in Palm springs: Palm Springs Villas II is located north of downtown with easy access to Interstate 10 freeway. Less than a mile to Indian Canyon Rd. to the town of Desert Hot Springs with the best Mineral Water daily bathing spas in the country. Just 2 miles from Spa Resort casino and famous Thursday night village festival year round. For 3 months renters a RT transportation bonus to Las Vegas for one person. distance (1.5 miles) to the heart of downtown and the famous Art Museum. Close to many celebraties homes. 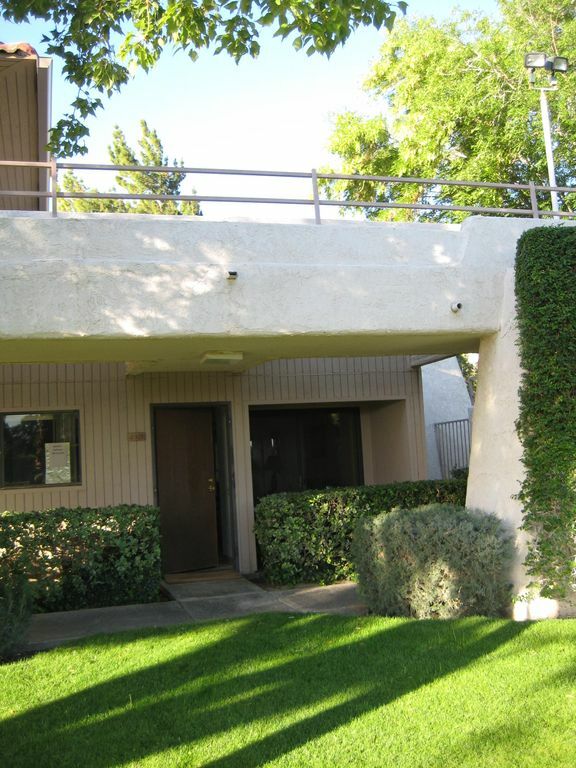 many activities within the complex: Palm Springs Villas II is a gated community. You can takes walks around the property early in the morning or late in the evening. You can ride your bike inside the property. Choose to swim in any of the six heated pools and 8 hot tubs. There is a stand alone hot tub near this unit. Meet new friends at the afternoon party by the pool. I am available to help the vacationers while they are in Palm Springs. Corner unit, unique in the building as no unit above. First floor, no steps, green belt in front of unit. Downstairs unit with easy access to pool and no steps to climb with groceries. Across the famous Palm Springs tramway, where is is cooler in the summer by 40 degrees. Unlimited parking in any space. You can watch TV from dining area. Vacuum cleaner, Fax service available, Travel information available from on Site Coordinator. International Channels on Dish Network Sat. system. Every thing was ok. Bath room needs faucets replaced. AC & heat working good. Thanks Jag for comments and information. It was a pleasure to have you and your wife as my guests. All the best. International film festival, golf ,year round village festival, antique stores within a mile. hiking and snow on top of San Jacinto mountains. Great mountain view when you are in the pool or hot tub. During the summer San Jacinto mountains are 40 degrees cooler. you can get a 4 month summer pass. April Special rate based on a 30 day rental rate.